The second trailer for the Netflix show featured a song that is currently not released, but will be out shortly. The song "Beautiful Crime" is composed by Grayson Sanders. 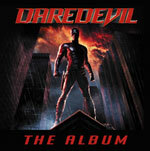 The Daredevil Album was released on February 4, 2003, and featured 20 new songs by groups such as Fuel, Evanescence, Saliva, Nickelback and more. Here is the official track listing for the album, which was released through Wind-Up Records. 1. Fuel - "Won't Back Down"
2. The Calling - "For You"
3. Saliva - "Bleed For Me"
4. Seether - "Hang On"
5. Nickelback - "Learn the Hard Way"
6. Drowning Pool feat. Rob Zombie - "The Man Without Fear"
7. Nappy Roots feat. Marcos Curiel of P.O.D. - "Right Now"
8. Moby - "Evening Rain"
9. Evanescence - "Bring Me To Life"
10. Chevelle - "Until You're Reformed"
11. Hoobastank - "Right Before Your Eyes"
12. Palo Alto- "Fade Out/In"
13. Revis - "Caught In The Rain"
14. BOYSETSFIRE - "High Wire Escape Artist"
15. Autopilot Off - "Raise Your Rifles"
16. Graeme Revell and Mike Einziger - "Daredevil Theme (Blind Justice Remix)"
17. Evanescence - "My Immortal"
18. Finger Eleven - "Sad Exchange"
19. Endo - "Simple Lies"
20. 12 Stones - "Let Go"
This 64 page book from Warner Bros Publications (ISBN: 0757913318) features all the guitar tabs and lyrics for the songs on the Daredevil album. It also contains eight pages of photos from the movie. BUY the Daredevil Music book! 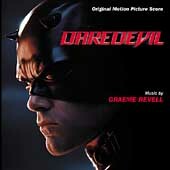 The Daredevil Score was composed by Graeme Revell, and the CD was released through Varese Sarabande on March 4, 2003. 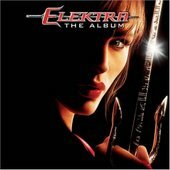 The Elektra album was released on January 11, 2005, through Wind-Up Records. 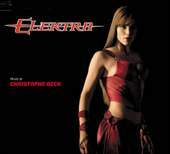 The Elektra score was composed by Christophe Beck and was released January 25, 2005 through Varese Sarabande. Track 10, entitled "The Man Without Fear", has the chorus of "Daredevil, fight for what is right...".